Cast aluminium front and back with aluminium body 240w x 290h x 300d. Rear opening with round post. Overall height 1300mm. Customers can purchase a SMALL TREASURE ALUMINIUM LETTERBOX (3240) made from cast aluminium. The mailbox is 240mm wide x 290mm high x 300mm deep. Also it comes mounted on a 50mm aluminium round post. The overall height is 1300mm high. An extension post can be purchased for an additional $33 including GST if the customer wishes to raise the overall height. Furthermore this model has a number plate and holder for newspapers or junk mail. Customers will note this letterbox is rear opening and has a key lock. Finally the Small Treasure Aluminium Letterbox is from our Classic/Colonial range. 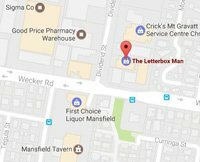 Customers please note the Small Treasure letterbox box is currently unavailable however we are able to substitute Royal Aussie Mail Box in its place, for the same price. This means you will get all the current features of the Small Treasure Letterbox with a larger mail box or you can have the Budget Treasure letterbox with the features of the Small Treasure (depth is the only difference) for the Budget Treasure price $160.00 including GST. Customers please also note the colour featured is no longer available. If you would like this colour, the closest is Wineberry which has a more purple colouring to the dark burgundy of the claret colour.